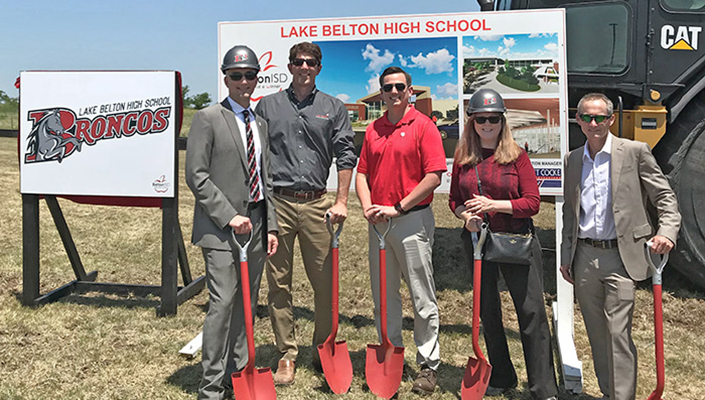 Belton, Texas — Students, faculty, and community supporters gathered this week for the historic ground breaking of Belton ISD’s new Lake Belton High School. The new high school will serve as the second comprehensive high school in the fast growth school district. The project is part of Belton ISD’s Roadmap to BISD 2025, a 10-year facilities master plan to provide capacity for growth through 2025. Attendees at the event included School Board Presidents spanning the last 38 years who witnessed the unveiling of the school mascot – the Lake Belton Broncos. The new 394,000 SF comprehensive high school will support 2,400 students. Key programming includes science, athletics, performing and fine arts, an auditorium and a core learning center. To encourage 21st Century Learning, architectural features include Learning Communities, Think Tanks and a Central Media Center, plus a Science Super Labs, CTE Program support and Dispersed Dining + Service. Lake Belton High School is slated for completion in time for the 2020-2021 school year. The design team led by O’Connell Robertson (architecture, MEP engineering, and interior design services) includes DLR Group (educational planning), Structures (structural), Pape Dawson (civil), Combs Consulting Group (technology/communications), BAi (acoustics/AV), Schuler Shook (theatrical planning), and Studio 1619 (landscape architecture), Foodservice Design Professionals (food service design), and Bartlett Cocke General Contractors (construction manager at risk). Earlier this year, Belton ISD held another groundbreaking to celebrate the start of construction for the new Charter Oak Elementary School. When completed for the 2019 start of classes, the new 82,300 SF Charter Oak Elementary School will have capacity for 800 students. O’Connell Robertson provided architecture, MEP engineering and interior design services for that project.